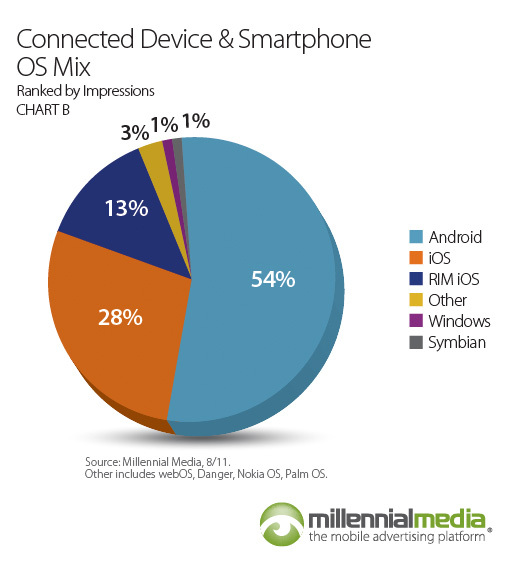 Millennial Media released a new Mobile Mix report today that shows Android growth in a way that many of us have been waiting for. Rather than just comparing smartphone operating systems, they also threw in connected devices like tablets and multimedia offerings. So what that means is, we get to look at Android (tablets and phones) vs. iOS (iPhones, iPads and iPod Touches) for the first time. The results? I think they speak for themselves in that big chunk of blueberry pie above. With 550,000+ new Android devices being activated each day, these numbers really aren’t surprising, so we’ll move onto to another subject that we have been pondering for the last couple of days. With rumors of the next iDevice running rampant, we have seen a barrage of reports suggesting that when it is finally released, will crush the competition with furious anger. Now, while any normal human being can fully realize how ridiculous that statement is, I guess we need to look at everyone’s definition of “crush.” If we are talking about sales of one particular phone or from one manufacturer, then yes, it will likely dominate. But if you look at market share, there is no stopping this Android train, leading me to the questions of the day. Do we care that Apple will have the top selling individual devices for the time being or do we care more about Android’s overall stranglehold on OS market share? And in a related question, would you rather a specific Android manufacturer attempt to compete with Apple for the top spot or are you OK with this seemingly endless flooding of new phones every other week?